Sylvia G Griffith, Design Consultant –Project Manager, has a degree from the Art Institute of Fort Lauderdale, Florida. Started her business in 1988 to present. 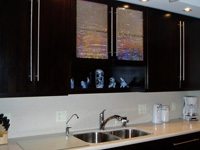 Her experience has been in both Residential and Commercial Design and Project Manangement. "We went to see our neighbors new kitchen….and fell in love with it. Sylvia was the designer and contractor for them. We called her and she came. As soon as she entered our house….she was off and running with so many ideas….ones we had never thought about. We hired her on the spot. When she told us the job would take 3 weeks…we were incredulous. We have all heard horror stories about the length of time a kitchen has taken. When I told my girlfriend…she said…If she does yours in 3 weeks…we’ll have her do ours….She has done their kitchen too. Our kitchen was completely gutted and wall taken down…no small job. She has done four projects in our small community in less than a year..
Sylvia has become a friend….we love her and her spirit….When we decide to do another project….Sylvia will be the one we call. If anyone wants to call us for more feedback…we give Sylvia permission to give our phone number to you." Step 1: I come to your home, we discuss your project and do scaled drawings. Step 4: Once you approve the Proposal, Designer is given a $500 deposit and we set a date to go select all items and make any re-selections for your project. This now becomes the actual contract with invoices from vendors and subcontractors. Step 5: The Invoices from vendors can be paid directly by you at my wholesale cost Project Mgmt fee of 25% of all invoices will be billed weekly of all work completed that week Mon-Saturday. Step 6: Most Projects take two weeks from time of demolition. All materials are purchased two weeks ahead of time and demolition will not start until all materials are ready for pick up. Step 7: If a Permit is required, there will be Contractor fees and Permit fees billed at cost. All workers are licensed and insured and will have complied with Workmen's Compensation Requirements. Contact us today for a Free in house Design Consultation and Estimate.